CEDAR CITY —A 5th District judge digressed from the state’s sentencing guidelines Friday when he handed down the maximum sentence to a defendant two sheriff’s deputies say changed their lives forever when he shot at them three years ago. Judge James L. Shumate sentenced Grant Louis Biedermann to two zero-5 year prison terms and six more months in the county jail after hearing from Iron County Sheriff’s Deputies Kellen Hudson and Cpl. Jeff Humphries. Biedermann was originally charged with two first-degree felonies for aggravated attempted murder following an incident Dec. 13, 2013, in which he fired a .40-caliber assault rifle on the two deputies, injuring Hudson below his bulletproof vest and above his belt. The deputies had gone to Biedermann’s trailer home in Kanarraville that day to assist the defendant after receiving a 911 call reporting he was suicidal. Humphries’ voice broke while relating to the judge how he felt that day as the supervisor over Hudson that was making the decisions and calling the shots. A jury found Biedermann guilty on lesser charges in July, convicting him of two third-degree felonies for aggravated assault and carrying a dangerous weapon while under the influence of alcohol and/or drugs, a class B misdemeanor. In an emotional plea to the court, Humphries told the judge that while he had been referred to as a “victim” in this case, he had never felt that way until the jury came back with the verdict. The deputy asked Shumate not follow suit but instead give Biedermann the maximum sentence allowed by law. After hearing the deputies’ pleas, Shumate ordered the men’s wives also be considered “victims” in this case, giving them an opportunity to seek the same help and resources as their husbands including counseling. He ordered the Iron County Attorney’s Office to assist accordingly. Before sentencing Biedermann, Shumate issued several insights from the bench offering his opinion on the case several times. 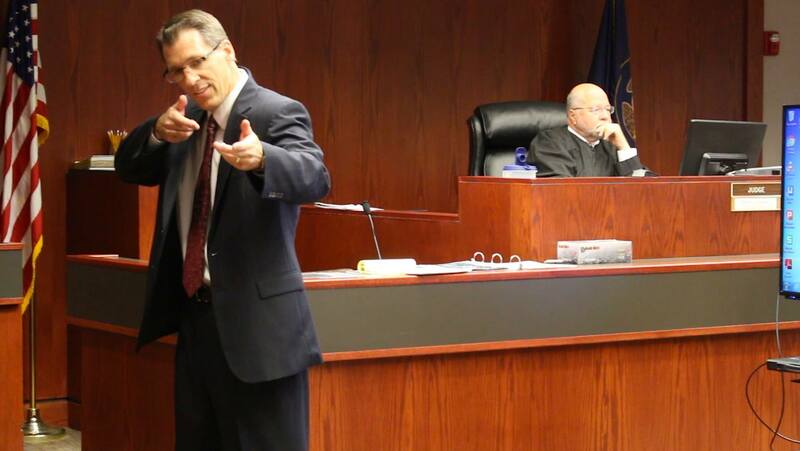 Shumate admonished Biedermann for even thinking the bullet from his gun inadvertently hit Hudson when it ricocheted off the officer’s truck – an argument the defendant’s attorney posed to the jury to create doubt and eliminate the issue of intent. The exact length of Biedermann’s prison sentence will be determined by the Utah Board of Pardons. However, it’s likely he won’t do more than a year, his attorney Greg Skordas said. Following the court hearing, Hudson and Humphries both told Cedar City News that while they aren’t happy about the sentence they know the judge did the best he could given the conviction verdict by the jury. Sheriff Mark Gower said he wasn’t pleased with how the case played out in the courtroom with the jury but he appreciates that the judge sentenced Biedermann to the maximum sentence available under the law. The deputies’ supervisor, Sgt. Nik Johnson, said he has witnessed firsthand how this event has changed the officers’ lives and knows the impact from it will last a lifetime. What a joke. This guy tried to murder 2 cops in cold blood, actually shoots one of them, and his sentence will be done in less than 10 years- “However, it’s likely he won’t do more than a year”?! How about we just mandate that he be housed by the jury that was so lenient on him? I’m waiting for godisdead to pipe up about how the cops were racist for not shooting him at the time of arrest. It’s good the 2 officers survived and went home to their loved ones. Praise the Lord ! A well written article Tracie. Thanks for the details. When I served on jury duty we had a case of a man abusing a step son . There was a male juror that almost seemed to be making arguments & excuses for the defendant . I had the sense this guy was also an abuser & was functioning to get ‘his type’ off . He & one other were able to hang the jury . It is actually the flawed rules that allow one individual to derail justice . Until our lawmakers grasp that , the public is screwed .